In a city that offers a lot of wow moments, one picked out from a week of many. Emperor Justinian I, with his Empress, Theodora left a mighty legacy on Constantinople during his reign from 527 to 565AD, dates that seem bogglingly ancient and obscure to the mind of this Englishman. While England was rooted in darkness during this period, in modern-day Istanbul a revival of the glories of the Roman Empire was going on. Justinian had a bit of trouble with rioting early in his reign, with the Nika revolt resulting in the destruction of Hagia Sophia. The destroyed Basilica’s remains can be seen in the grounds of today’s church, sitting slightly forlornly with large tourist’s bottoms resting on them after inspecting the mosaics. The marvellous Byzantium1200 project has a reconstruction of this earlier church as well as many other 3D images of lost Constantinople. What a superb website. Justinian’s ambition and drive – which characterised his reign – is best epitomised by visiting the rebuilt Hagia Sophia, constructed between 532 and 537. The only downside is that every man jack in town is either in Hagia Sophia, the Blue Mosque or walking between the two at any one time. But the chaps behind Hagia Sophia, Isidore of Miletus and Anthemius of Tralles left another fine construction. Don’t act like you don’t know them. They are serious men of history and to be saluted. Isidore and Anthemius warmed up a little by building the Church of Saints Sergius & Bacchus, fulfilling a promise made by Justinian to dedicate a church to them in thanks for their reputed delivery of him, in a vision, from a treason charge in his youth. This church, built between 527 and 536, has been since 1513 a mosque, known today as Küçuk Ayasofya Camii, or Little Hagia Sophia. Pick up John Freely and Hilary Sumner-Boyd’s brilliant Strolling Through Istanbul for a detailed architectural guide to the building and its precincts. Visiting is a joy. 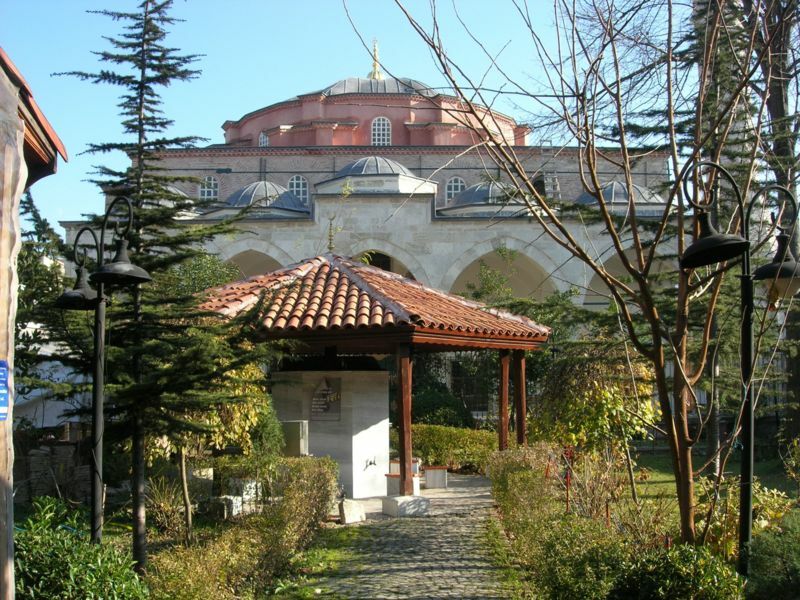 Still functioning as a neighbourhood mosque, Little Hagia Sophia feels quiet, cool and sacred. It is easy to imagine post-conquest Constaninople, and further back the role the place would have had as a neighbourhood eastern Christian. The few visitors who make their way here stroll around in silence. It is impossible not to be awed by the sense of light and space. The only thing dragging you into the modern age is the occasional commuter train trundling out of Sirceki railway station bound for the suburbs or distant Thrace. Within the compound is an Islamic burial-ground and a cool, tranquil tea garden lined with small shops. This leafy place is perfect for a restful hour reading or, in the case of our young companions, breaking out the wooden train-set that goes everywhere with us. In two of the shops artisans work on hand-crafted illuminated drawings of Dervishes and centuries-old scenes of Istanbul which make wonderful souvenirs. To reach Little Hagia Sophia, turn your back on its big brother and aim for the Arasta Bazaar. Walk through here and on exiting follow the street downhill – you’ll start to see the familiar shape emerge at the bottom of the street. There’s no entry fee but donations are welcome, and arms and legs should be covered. On your way back to the marvellous Sultanahmet scrum, or perhaps while munching a fish sandwich on the dockside at Eminönü, you might wish to reflect that for all Justinian’s achievements, when he died Byzantine scholar and historian Procopius wrote a bilious Secret History of his life tearing him to shreds. 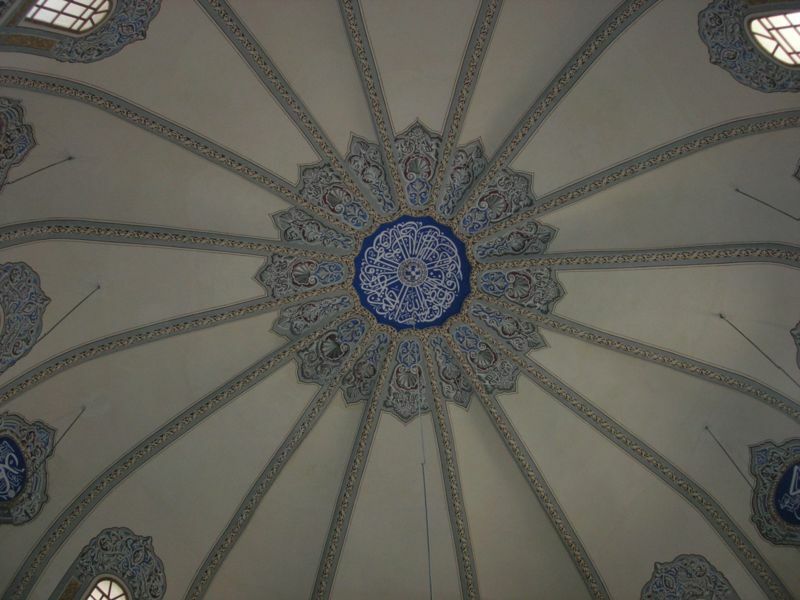 What a fascinating, complicated and confusing place Istanbul is, and so much of its history can still be explored. Now here’s a thing. In the 1930s, Greyhound Racing was a serious threat to the popularity of football and forty stadiums across the Uk hosted meets. There were several tracks in London: Catford, Hackney Wick, Harringey, New Cross, Stamford Bridge, Walthamstow, West Ham, White City (which was the spiritual home of the sport), Wimbledon and cavernous original Wembley Stadium among them. Romford in Essex also hosted meets, as it continues to do to this day. 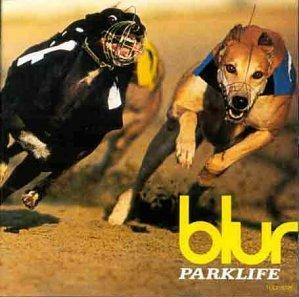 Wimbledon is London’s only other functioning dog track. For the racing public of Essex, it appears that simply watching dogs chase a mechanized hare was not enough. 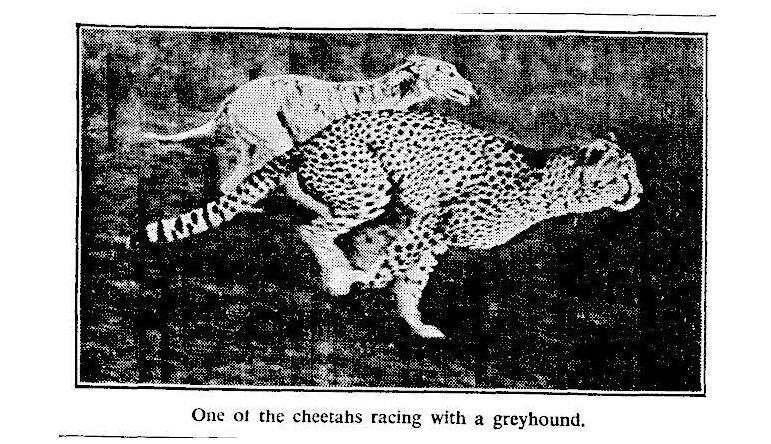 Cheetahs, shipped from Kenya and given a few months to acclimatise, became in 1937 the star attraction at Romford. The Wiki for Harringay Stadium picks up the story, but frankly it poses more questions than it answers. Who made the decision? How were cheetahs persuaded to race for human edification? And did they try to eat any of the dogs? Why did racing stop so mysteriously? I sought out the Times clipping referred to in the entry, but to be honest it just waffles on about cheetahs and how good they are at racing without providing any more facts. It also does not provide the information in the Wiki, but at least offers some valediction that the whole thing isn’t some kind of fanciful hoax. Anyone know anything? Anything at all? The greatest wonder of the internet is how it has brought long-lost books back to life. Far from displacing the printed word, the web in fact makes more of it accessible. Old St Paul’s Cathedral by Canon William Denham is one long-lost wonder which anyone can find and enjoy via the Gutenberg Project. 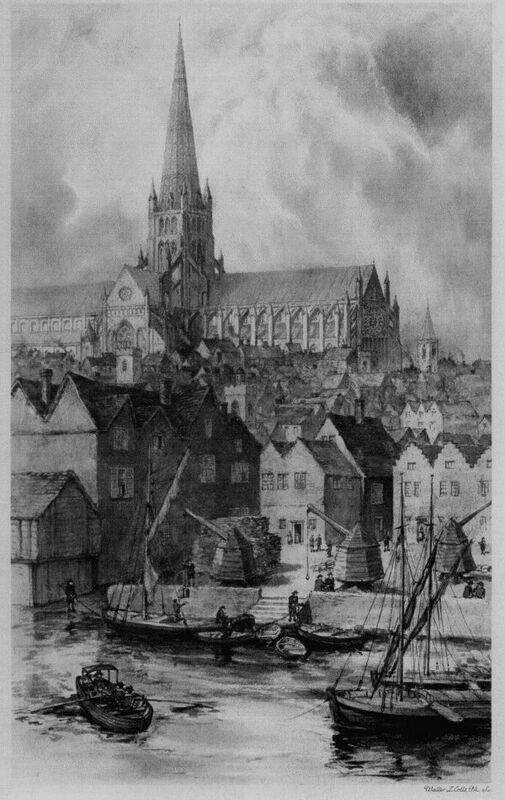 The frontispiece of the book is a lovely illustration of Old St Paul’s, complete with spire, with Three Cranes Wharf in the foreground. Old St Paul’s stood for nearly 600 years (1087 – 1666) and was the most famous victim of the Great Fire of London. It was falling into disrepair in the decades before the fire and it is a little-known fact that Sir Christopher Wren had been commissioned to supervise renovations before the fire. the wooden scaffolding built to facilitate repairs helped seal the Cathedral’s fate. The spire was destroyed by lightning in 1561, which is why illustrations of the Great Fire show St Paul’s in its rather truncated form. At one of these Whitsun festivals (it was in 1327) another procession was held, no doubt to the delight of many spectators. A roguish baker had a hole made in his table with a door to it, which could be opened and shut at pleasure. When his customers brought dough to be baked he had a confederate under the table who craftily withdrew great pieces. He and some other roguish bakers were tried at the Guildhall, and ordered to be set in the pillory, in Cheapside, with lumps of dough round their necks, and there to remain till vespers at St. Paul’s were ended. Fans of unusual engineering works thrill to tales of the spiral escalator which was found, derelict and broken, at the foot of what is now the liftshaft of Holloway Road Piccadilly Line station. This post tells the story so far. In short, I am working on a new museum ‘revisiting collections’ initiative, which aims to capture and promote the ideas, stories and developments behind key engineering objects now in storage at Acton. – (The Edwardian spiral escalator being one of those selected.) It is envisaged that the project will achieve these aims by improving the conservation, labelling and interpretative display of such items. A careful start was made in November on piecing together what remains of this rather perplexing and unique jigsaw puzzle. To start the first phase of work, a clearer understanding was needed of the volume of material in our care. To do this, we temporarily assembled as much of the spiral structure using wooden pallets and blocks. Following on from this, three corresponding sections (offering best display value) were selected for further inspection and conservation. 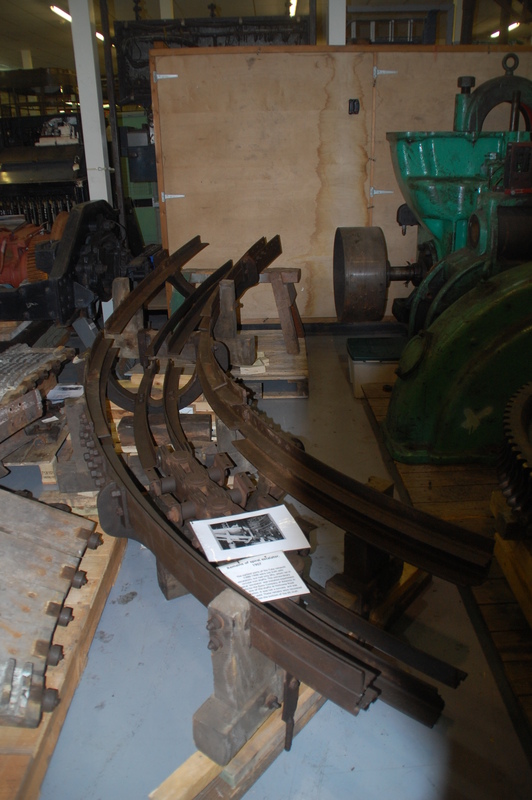 – Its interesting to note that on closer examination of the drive chain mechanism, a large number of track runner bearings were found to be in very good condition, many containing original grease over 100 years old! 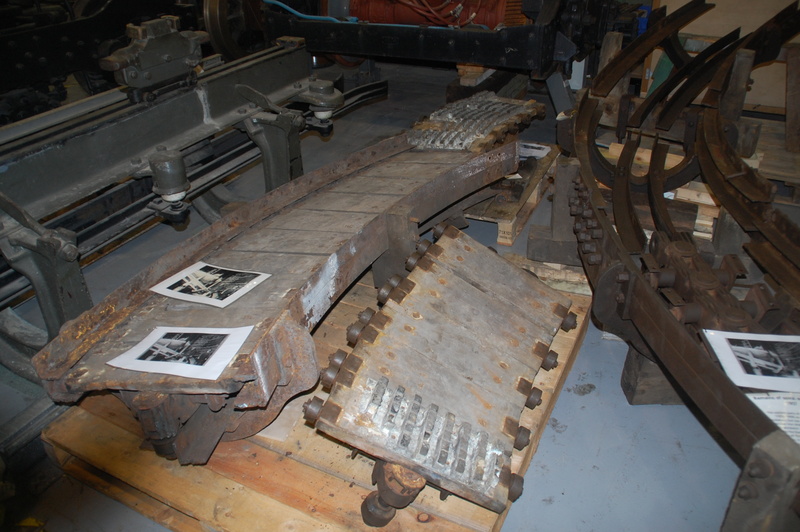 Throughout January the metalwork (including exterior framework and chain guide channel) was stripped, cleaned and treated with a conservation grade preservative. Planning is in progress to commission the construction of a specifically designed base, which will support the permanent display of several reassembled parts. Scheduled to be completed by summer 2010, it will enable a large (4 meter length) section of spiral escalator to be displayed at the correct incline, allowing visitors to gain a better understanding of how it possibly once worked. When complete, the top will look most complete, and the spiral escalator will be stripped away towards the bottom. Tim also filled in a few blanks in my knowledge. He said that what records existed suggested that it was successfully built, and used in a test phase for one day but never saw public use, eventually falling out of favour and into disrepair. As you can see from Tim’s quotes above, over the next few months the reconstruction outlined above will be taking place, so by the time of the next Acton Open Day there should be plenty of interest. Big thanks to Tim for taking the time and trouble to call. Also in Acton in April modellers came up with some seriously impressive creation. 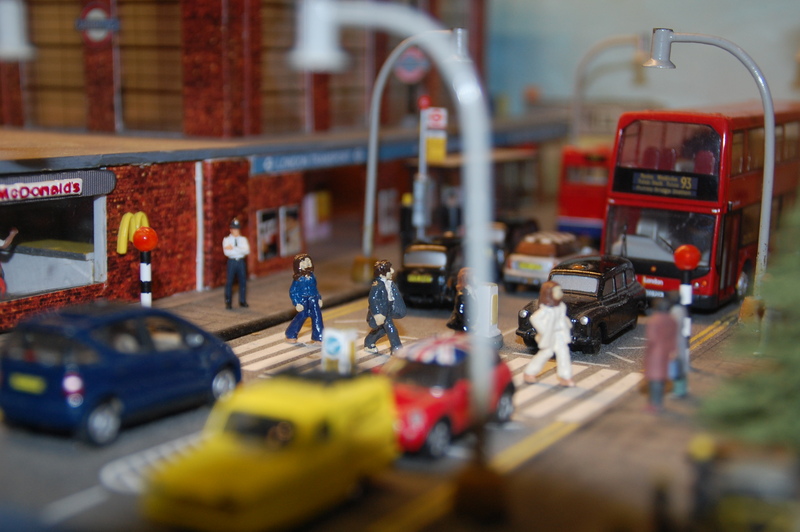 This fictitious incarnation of an Abbey Road station includes some hairy miniature Beatles strolling across the famous zebra crossing. I’m late in welcoming Blackpool FC to the Premier League for next season. 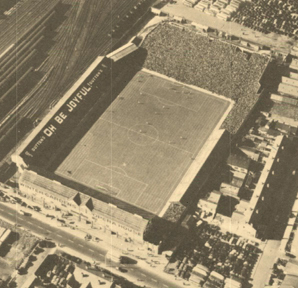 Bloomfield Road, the Seasider’s home ground, may look little like it does in this wonderful aerial shot from the 1950s, but the painted exhortation ‘O Be Joyful’ will be ringing true both for Tangerine-clad BFC fans and visiting supporters, who have effectively swapped an away trip to Burnley for the delights of a visit to the Lancashire coast. It’s a shame that the mighty Kop, filled to bursting in this picture, won’t be there to admire. But Blackpool away is going to be the first fixture I look for when the fixtures are announced.